"Can my dog eat venison?" "Can my dog eat deer meat?" These are questions I have encountered many times, in many arenas. From friends curious about a raw diet, questions left here, and people posting in various raw feeding Facebook groups. 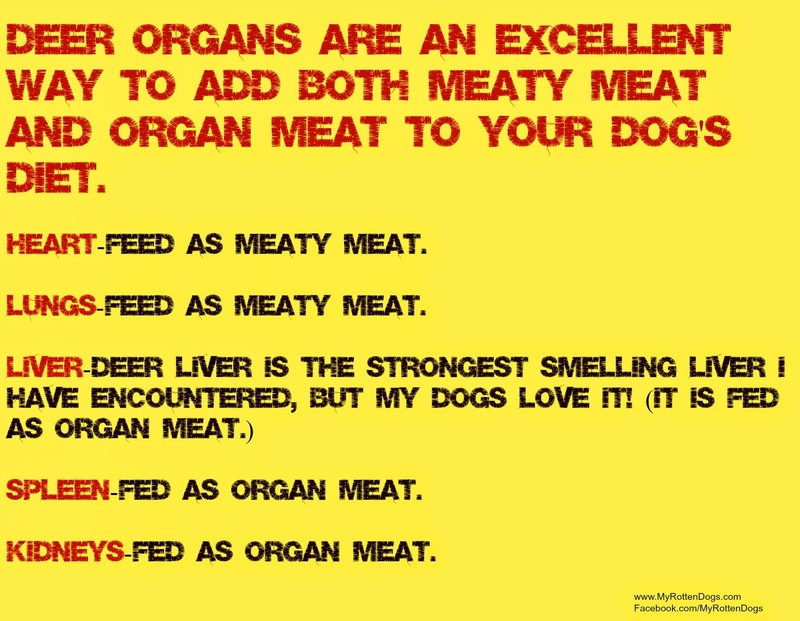 I am a huge fan of feeding venison (or any wild game) to a raw fed dog. There are numerous benefits to feeding venison (or other wild game). It is considered "organic" and "free range." Wild game is not raised in a feed lot. Depending on location, deer can eat a large amount of field corn, which is most likely GMO. But they also get fresh air, sunshine, and plenty of exercise. It can be a nice, novel, or exotic protein for a dog with food allergies or sensitivities. Some dogs cannot tolerate beef. Or chicken. Or pork. Or all of the above. I feel for the owners of these dogs, as fighting with food allergies in a canine can be very stressful. It also offers protein variety. As I often preach, variety is incredibly important in the diet of a raw fed dog. It is high quality, lean red meat. It contains high levels of Omega 3 fatty acids. Depending on one's situation, it can be free, or relatively inexpensive. Which Parts of the Deer Can be Fed? Any boneless muscle meat can be safely fed. If you are lucky enough to have friends or family gift you with freezer burnt deer meat, feed away! Ground venison, venison roasts, and venison steaks are all excellent additions to a raw dog food diet. I would caution against venison sausage, because the added seasonings can cause stomach upset. You have somehow gotten an entire deer. Now what? Just a couple of tips-spleen doesn't smell too good, and the texture of lung can bother some dogs. Lung can be frozen in chunks for texture sensitive dogs, or dehydrated to make treats. Feed all the skeletal muscle meat. All. Of. It. This is where the popular saying, "Know thy dog" comes into play. For my personal dogs, the only venison bones I allow them to eat are the ribs and brisket bones, and only with meat attached. I do not give them weight bearing bones from large animals, including deer, for fear of tooth injuries. For smaller dogs, or smarter chewers, a leg or shoulder bone, covered in meat, may be safely given, if one feels the dog will not attempt to eat the bone itself. Again, know thy dog. I personally take a few precautions when feeding venison or any wild game. Freeze all wild game for at least three weeks prior to feeding. This is to kill any parasites that the game may be hosting. The one exception to this is wild boar from northern climates, who can carry a frost/freeze resistant strain of trich. For this reason, I would not feed wild boar. As when introducing any new protein, start slow, offering just a little bit. Again, know thy dog. Some deer have/carry Chronic Wasting Disease (CWD) a prion disease. While there are no documented cases of CWD being transmitted to wolves or dogs, it is transmissible to humans. Avoid contact (or feeding if you're worried) with the spinal cord, spinal column, and brain. 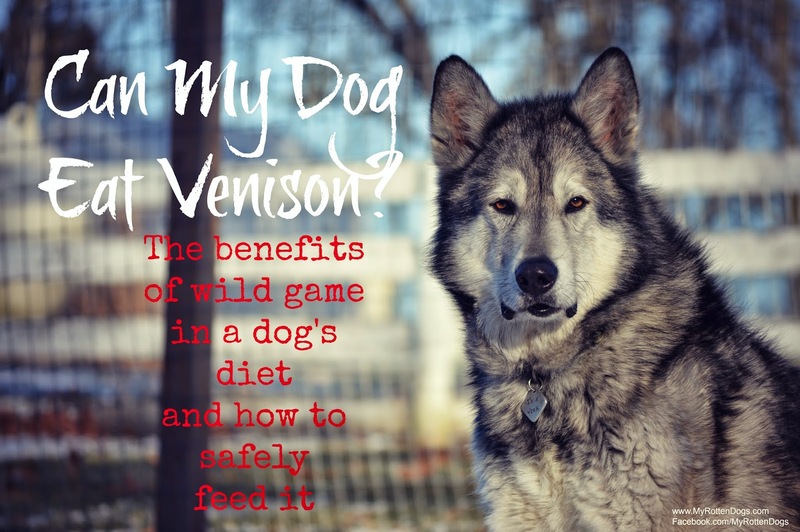 So you have no access to wild venison, but want to offer this protein to your dog? Fortunately, some commercial raw venison formulas exist. Bravo, Primal, Nature's Variety, and Blue Ridge Beef all offer venison formulas, and there are a few venison-based kibbles. As with humans, variety is important in a dog's diet. Venison and other wild game can provide a novel, exotic, tasty protein source for your dog. Does your dog have a favorite protein/meat? My boys love venison and so does the cat! I had some misinformed person tell me once that the parasites carried by North American and European venison made it unsafe for raw feeding. Thank you for this concise, clear post on safely feeding a very healthy animal to our pets! That was interesting and informative. Have a fabulous Friday. Interesting! I love learning about raw diets! Thanks for sharing. Valuable info for future reference. Our dogs absolutely adore venison, especially our little pom! In fact, hubby and I eat both venison roast and ground venison- whenever I made a crock pot roast- Scooter lays in the kitchen begging all day! I really loved the info about how to feed each portion of the deer to use up most of it- thanks! Great tip to freeze the venison before feeding raw. This would be a great way to help reduce the cost of feeding a raw diet if you're a hunter or you know someone that enjoys hunting.